Fungi produce a variety of terpenoids that exhibit strong antimicrobial, antinematode, or antifeedant properties (Figure 3). Figure 1 Examples for aromatic defense compounds of mushrooms. 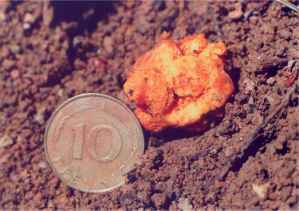 Figure 2 Carrot truffle (Stephanospora caroticolor). For instance, sesquiterpenoids such as velleral (13) and isovelleral (14) are present in a variety of Russula species and milk caps such as Lactarius vellereus and are responsible for their pungent taste. In the mushrooms, the precursor of velleral (13) and isovelleral (14) is stored in form of the stable stearoylvelutinal (11). 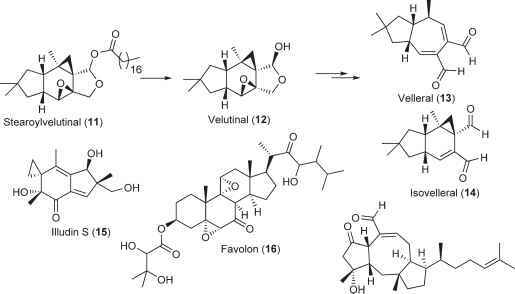 Wounding of the tissue results in rapid enzymatic cleavage of this ester to the highly instable hemiacetal velutinal (12) which suffers ring opening to isovelleral (14) and rearrangement to velleral (13). Interestingly, the ratio of 13 and 14 generated upon injury of velleral/isovelleral-producing mushrooms differs characteristically from species to species. The highly reactive dialdehyde moiety of velleral (13) and isovelleral (14) readily reacts with basic amines such as lysyl residues of proteins forming stable pyrrol derivatives, thus destroying the protein's function explaining why Lactarius vellereus is not attacked by fun-givores. The occurrence of defensive dialdehydes is not restricted to some fungi but is also known from animals, plants, and marine organisms, for example, caulerpynene from the alga Caulerpa taxifolia (see Defense Strategies of Marine and Aquatic Organisms and Animal Prey Defenses). Similiarly, the cytotoxic sesquiterpenoid illudin S (15) isolated from the jack o'lantern mushroom Omphalotus olearius might serve to deter feeding animals. The compound consists of an a,P-unsaturated enone moiety that is prone to react with nucleophiles from biomolecules, thus destroying their function. 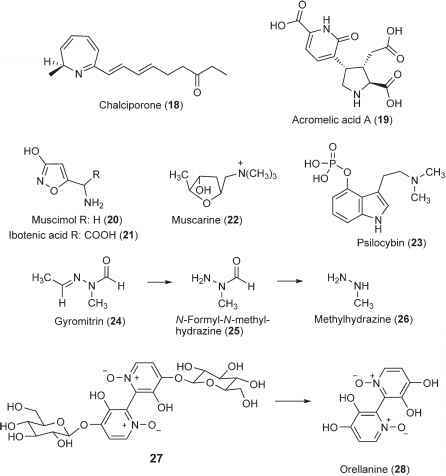 Figure 3 Examples of terpenoids used for defense by mushrooms. range of fungi, thus providing a weapon against possible competitors. Furthermore, the sesterterpenes ophiobolin C (17) and related compounds produced by phytotoxic Ophiobolus species are highly toxic for the nematode Caenorhabditis elegans. The compounds inhibit its motility at low concentration (5 mM). Because nematodes consume half of the fungal biomass in soil, it is not surprising that fungi evolved strategies to prevent their attack. Ophiobolins exhibit a reactive «^-unsaturated aldehyde moiety that may be responsible for its bioactivity (Figure 3). 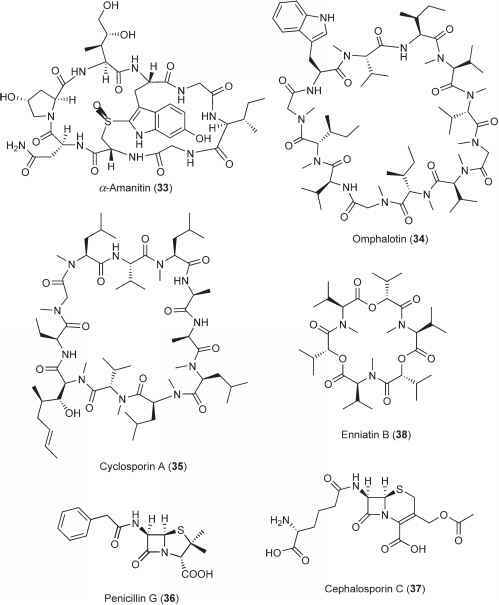 Fungal alkaloids represent a class of powerful antifeedants that often are strong poisons (see Figure 4). Many alkaloids, for example, chalciporone (18), exhibit a bitter or pungent taste that discourages feeding animals after the first bite from further attack. Acromelic acids, such as 19, from the Japanese mushroom Clitocybe acromelalga cause after consumption of the mushroom, sharp pain and a long-lasting reddish edema of hands and feet in humans and therefore probably also in other mammals. The toxicity of alkaloids from the fly agaric mushroom (Amanita muscaria, Figure 5) has been used since a long time by preparing extracts from the fruiting bodies in order to prepare fly traps. The constituents of the fly agaric mushroom muscimol (20) and mainly ibotenic acid (21) protect the fly agaric mushroom from attack. The more famous muscarine (22) indeed only occurs in minor amounts in the mushroom. Whereas muscarine (22) mimics acetylcholine and thus activates acetylcholine reception, ibotenic acid (21) interferes with the glutamic acid receptor and muscimol (20) binds as structural analog of 7-aminobutyric acid (GABA) to the GABA receptor. Consequently, 20-22 act as neurotoxins leading to confusion, dizziness, tiredness, and even death. A study with the fungivorous opossum Didelphis virginiana provided evidence that this animal learns to avoid toxic fungi, such as the muscimol containing A. muscaria..
Biogenic amines, for example, psilocybin (23), are known from a variety of Psilocybe species such as the 'magic mushroom' P. cubensis or P. mexicana. Psilocybin exhibits strong psychedelic properties and is structurally closely related to the defense compounds of some toads (see Animal Prey Defenses). Hence, it provides the mushroom protection against fungivores. The false morels (Gyromitra esculenta and G. gigas) produce gyromitrin (24) and related compounds. After consumption of the fruiting bodies gyromitrin (24) is decomposed first to formylmethylhydrazine (25) and finally to methylhydrazine (26). Breakdown to formylmethylhydrazine (25) is very fast, whereas the degradation to methylhydrazine (26) takes more time. Therefore, it is likely that formylmethylhydrazine (25) plays a major role in the chemical defense of false morels. An open question is how the fungus stores the labile gyromitrin (24). Hydrazine derivatives are potent inhibitors of pyridoxyl phosphate-dependant enzymes, such as transaminases. In addition to the interference with these important enzymes of the primary metabolism, oxidation and further breakdown leads to hepatotoxic and cytotoxic methylation reagents such as methyl nitroso derivatives. 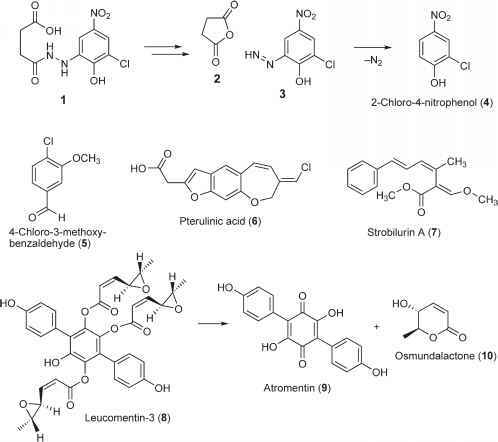 Figure 4 Examples for alkaloids as defense compounds from mushrooms. Figure 5 Fly agaric mushroom (Amanita muscaria). Photograph by Dr Birgit Schulze Figure 6 Picture of the orellanine-producing Cortinarius rubellus. Photograph by Dr. Peter Spiteller. (28) occurs in its labile glycosylated form 27, but the core alkaloid is responsible for the toxicity. However, since the toxic effects of orellanine (28) often need several days to develop, its ecological function may not primarily be to deter or kill feeding animals. The highly toxic respiratory chain blocker hydrocyanic acid (HCN) serves many organisms such as plants or arthropods (see Plant Defense and Animal Prey Defenses) as an efficient defense compound. Release of HCN has also been observed for numerous representatives of the families of Tricholomataceae, Pleurotaceae, Polyporaceae, and Stereaceae, for example, from the fairy ring mushroom Marasmius oreades (Tricholomataceae). 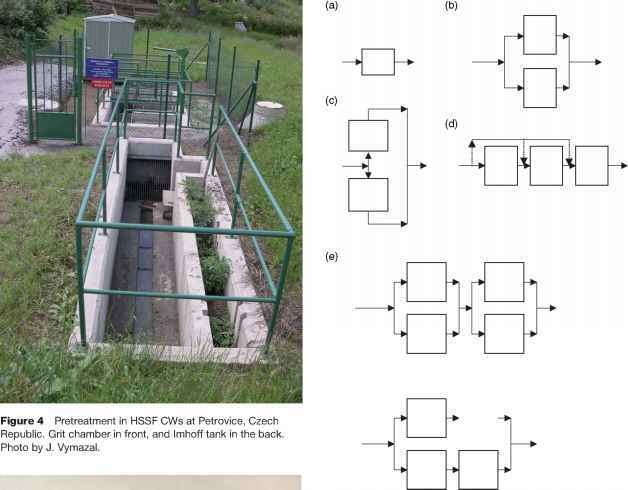 However, so far the mode of HCN generation has only been studied for a mycelial culture of a phytopathogenic, unclassified basi-diomycete which probably produces HCN from glycine and for the fruiting bodies of Aleurodisus amorphous. Figure 7 Aleurodiscus amorphus growing on dead wood. Photograph by Dr. Peter Spiteller. (29), was identified (Figure 8). 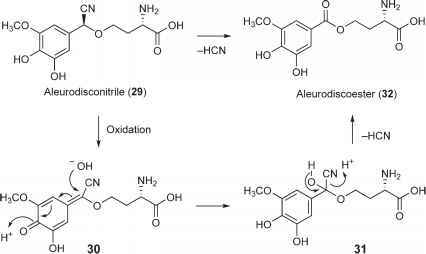 Upon injury, aleurodisconitrile (29) is enzymatically oxidized to the quinone methide 30. Addition of water results in the labile intermediate 31 that readily releases HCN under formation of aleurodiscoester (32). Similar to cyanogenic plants (see Plant Defense), the fungus stores the toxic HCN in the form of a safe precursor, probably to protect its own tissue from HCN. Wounding activates oxidizing enzymes, such as tyrosinases which oxidize the cyanogenic precursor and release HCN (activated defense). However, in contrast to plants which store HCN in form of glycosides, A. amorphus has evolved a cyanogenic ether as storage form for the toxic HCN. Many fungal peptides that are often formed by nonribo-somal peptide synthases (NRPSs) are powerful poisons for competing microorganisms as well as for fungivores (Figure 9). For example, the consumption of the death cap (Amanita phalloides) causes severe poisoning because of the presence of cyclic octapeptides such as a-amanitin (33) that block RNA polymerases. The cyclic peptide omphalotin (34) from the jack o'lantern mushroom Omphalotus olearius has been found to be highly active against nematodes. Figure 8 Release of HCN by the cyanohydrine ether aleurodisconitrile. Penicillin G (36) Figure 9 Toxic peptides from mushrooms. against nematodes. Furthermore, the cyclosporins became highly valuable in transplantation medicine being powerful immunosuppressants. Also the penicillins belong to the peptide-derived antibiotics; for example, penicillin G (36) and the closely related cephalosporins such as 37 (Figure 9). Both compound classes are produced by fungi, such as Penicillium sp. and Cephalosporium acremonium. In their natural environment, penicillins and cephalosporins serve the fungi to compete with bacteria for living space. However, they are more famous for the fact that they revolutionized medicine in the middle of the last century providing an effective therapy against microbial infections. But, their heavy use promoted the evolution of penicillin-resistant microbial pathogens that occurred already 4 years after their introduction as antibiotics (see Evolution of Defense Strategies). Similiarly, Fusarium sp., for example, Fusarium lateri-tium, are well defended against insects and other bacterial or fungal microorganisms by enniatins. Enniatins, for example, enniatin A (38), are ionophoric cyclic depsi-peptides that selectively bind potassium. Thus, the compounds disturb the cell membrane potential finally leading to cell death. Toxic membrane active peptaibols are widespread among fungi, for example, Trichoderma viride produces the intensively studied alamethicin. Animals and higher plants produce so-called defensins, peptide antibiotics that are active against bacteria, fungi, and viruses. 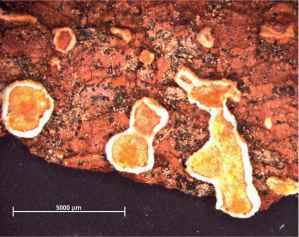 Recently, the first fungal defensin, the pep-tide plectasin, was isolated from the saprophytic ascomycete Pseudoplectania nigrella. This peptide turned out to be highly active toward bacteria which are multi-resistant against common antibiotic treatment. 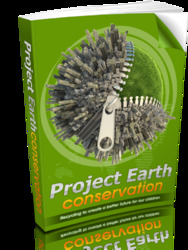 Clearly, the fungus will benefit from plectasin allowing a strict control of its microbial environment.